The Costco Effect. It got me, and I should know better. The Costco Effect is when a gigantic item looks normal sized because it's in Costco. 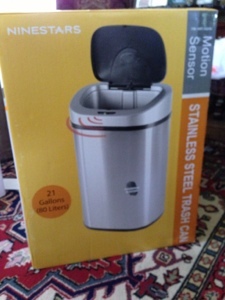 I had some worries about the size of this flip-top trash can, but, since my current can is broken, I've been anxious to get a replacement. I admit, in the store, this can looked a little larger than my current can, but I had no idea how much larger until I got it home. I'm going to have to return it. My current trash bags are 13 gallon bags. This new trash can is 21 gallons, more than 50% bigger than the bags. This must be for commercial kitchens or doctors' offices, definitely doesn't fit in my tiny kitchen.